Own the sky with Parrot ultimate Full HD drone camera Fitted with a 14 mega-pixel camera with fisheye lens, the Parrot Bebop Drone can produce videos in Full HD 1080p with a 180° mobile camera. Boasting fully digital image stabilising technology, the Bebop Drone films during flight, whatever the movements inherent in the quadricopter. Stunning stability Using algorithms developed by Parrot engineers, the Bebop Drone relies on an exclusive 3-axis image stabilising system. Filming remains stable, however far the drone leans over, adjusting for any turbulence. To ensure optimum stability without compromising easy handling, the Bebop Drone merges data from many 3-axe sensors: an accelerometer, gyroscope and magnetometer. An ultrasound sensor with a range of 5 m, a pressure sensor, and a vertical camera measure ground speed. The Parrot Bebop Drone has 2 embedded Wi-Fi bi-band antennas to handle the two frequencies 2.4 GHz and 5 GHz in MIMO. It generates its own network meeting the latest Wi-Fi 802.11 standards. You can select a frequency depending on network congestion. 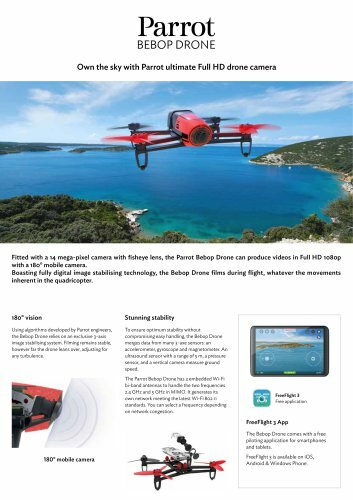 FreeFlight 3 Free application FreeFlight 3 App The Bebop Drone comes with a free piloting application for smartphones and tablets. FreeFlight 3 is available on iOS, Android & Windows Phone.